presumably have little effect on stratospheric temperatures. from the 1960s until today would need to be explained. al., 1992) or large climatological anomalies. However, even the most ardent fans of anthropogenic global warming theory don't agree on why an increase of "heat trapping" greenhouse gases would have the opposite effects of causing the stratosphere to cool and the troposphere to warm. Further, many warmists claim any source of warming including solar activity, cloud changes, ocean oscillations, etc. would cause a mid-troposphere "hot spot" and overlying cooling of the stratosphere, and would not necessarily be a signal or "fingerprint" of anthropogenic global warming. From 1958 until 1979, a non-significant trend (0.06 ± 0.06 °C decade−1 for NCEP) and slightly cooling trends (−0.12 ± 0.06 °C decade−1 for RICH) are found in the lower troposphere. The second period from 1980 to the end of the records shows significant warming (0.25 ± 0.05 °C decade−1 for both NCEP and RICH). Above the tropopause a significant cooling trend is clearly seen in the lower stratosphere both in the pre-1980 period (−0.58 ± 0.17 °C decade−1 for NCEP, −0.30 ± 0.16 °C decade−1 for RICH and −0.48 ± 0.20 °C decade−1 for FU-Berlin) and the post-1980 period (−0.79 ± 0.18 °C decade−1 for NCEP, −0.66 ± 0.16 °C decade−1 for RICH and −0.82 ± 0.19 °C decade−1 for FU-Berlin). Thus, although it appears the stratosphere may be cooling, and this could be due to increased greenhouse gases increasing radiative surface area and thus emissivity to space, there is still no evidence of a mid-troposphere "hot spot" predicted by climate models. The slight cooling to no change of lower tropospheric temperatures from 1958-1979 found by this paper also don't support AGW theory since CO2 levels rose ~7% during that period. Abstract. This study provides a new look at the observed and calculated long-term temperature changes from the lower troposphere to the lower stratosphere since 1958 over the Northern Hemisphere. The data sets include the NCEP/NCAR reanalysis, the Free University of Berlin (FU-Berlin) and the RICH radiosonde data sets as well as historical simulations with the CESM1-WACCM global model participating in CMIP5. 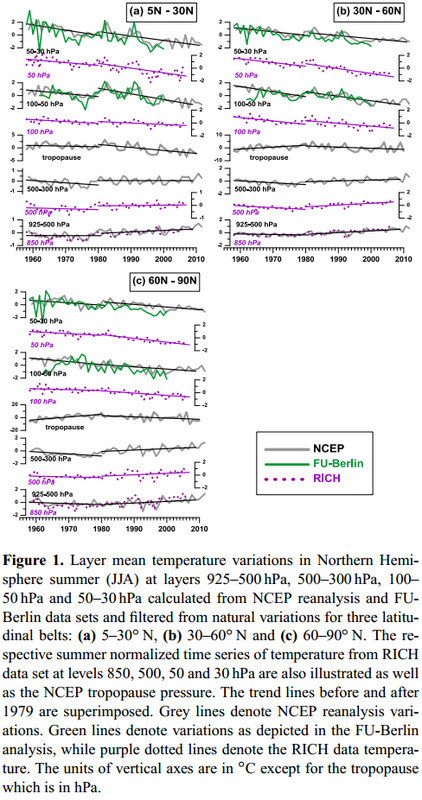 The analysis is mainly based on monthly layer mean temperatures derived from geopotential height thicknesses in order to take advantage of the use of the independent FU-Berlin stratospheric data set of geopotential height data since 1957. This approach was followed to extend the records for the investigation of the stratospheric temperature trends to the earliest possible time. After removing the natural variability [it is impossible fully distinguish natural variability from anthropogenic] with an autoregressive multiple regression model our analysis shows that the period 1958–2011 can be divided into two distinct sub-periods of long-term temperature variability and trends: before and after 1980. By calculating trends for the summer time to reduce interannual variability, the two periods are as follows. From 1958 until 1979, a non-significant trend (0.06 ± 0.06 °C decade−1 for NCEP) and slightly cooling trends (−0.12 ± 0.06 °C decade−1 for RICH) are found in the lower troposphere. The second period from 1980 to the end of the records shows significant warming (0.25 ± 0.05 °C decade−1for both NCEP and RICH). Above the tropopause a significant cooling trend is clearly seen in the lower stratosphere both in the pre-1980 period (−0.58 ± 0.17 °C decade−1 for NCEP, −0.30 ± 0.16 °C decade−1 for RICH and −0.48 ± 0.20 °C decade−1 for FU-Berlin) and the post-1980 period (−0.79 ± 0.18 °C decade−1 for NCEP, −0.66 ± 0.16 °C decade−1 for RICH and −0.82 ± 0.19 °C decade−1 for FU-Berlin). The cooling in the lower stratosphere persists throughout the year from the tropics up to 60° N. At polar latitudes competing dynamical and radiative processes reduce the statistical significance of these trends. Model results are in line with reanalysis and the observations, indicating a persistent cooling (−0.33 °C decade−1) in the lower stratosphere during summer before and after 1980; a feature that is also seen throughout the year. However, the lower stratosphere CESM1-WACCM modelled trends are generally lower than reanalysis and the observations. The contrasting effects of ozone depletion at polar latitudes in winter/spring and the anticipated strengthening of the Brewer–Dobson circulation from man-made global warming at polar latitudes are discussed. Our results provide additional evidence for an early greenhouse cooling signal in the lower stratosphere before 1980, which appears well in advance relative to the tropospheric [assumed] greenhouse warming signal. The suitability of early warning signals in the stratosphere relative to the troposphere is supported by the fact that the stratosphere is less sensitive to changes due to cloudiness, humidity and man-made aerosols. Our analysis also indicates that the relative contribution of the lower stratosphere versus the upper troposphere low-frequency variability is important for understanding the added value of the long-term tropopause variability related to human-induced global warming. The Stratospheric cooling in the last 2 decades of the 20th century, in fact, proves Svensmark's effect. To connect the dots, simply see Osprey, S.M. et al., "Sudden stratospheric warmings seen in MINOS deep underground muon data," Geophys. Res. Lett, doi:10.1029/2008GL036359. The researchers observed "intermittent and sudden increases in the levels of muons during the winter months, the jumps in the data occurring over just a few days and coinciding with very sudden increases in the temperature of the stratosphere (by up to 40 deg C in places)." The stratosphere, as it turns out, reacts thermally to variations in cosmic ray fluxes. A high flux heats the stratosphere, whereas a low flux lets it cool. During the last 2 decades of the 20th century, the sun was at the highest activity level in 9000 years. This would have sharply reduced the cosmic ray flux and the stratosphere, unsurprisingly and in agreement with the observations made later by Osprey et al, would have cooled in response. Interesting, but at least from this paper there doesn't seem to be a trend reversal of stratospheric cooling with the decline in solar activity since the end of the 20th century, although perhaps too early to see. CFC destruction of stratospheric ozone caused the cooling in the stratosphere with the resultant UVB light striking the earth and warming it some 0.6C. The ozone stopped diminishing in 1998 when the Montreal Protocol was implemented that shut down all CFC manufacturing plants in developed nations. The earth hasn't warmed any more after 1998. Why atmospheric scientists have not recognized this befuddles my brain.